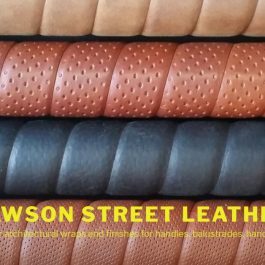 Dawson Street Leather Co can design, supply and install leather wrapping on posts, handrails and handles for your project. Choose from the standard range of leather wraps or discuss your creative thoughts with Dawson Street Leather Co about your specific project, design elements such as patterns, stitching and finishes can be applied to create a unique design. Leather is sourced from local and overseas tannerys that are certified and sustainable which allows Dawson Street Leather Co to source leathers to suit your project needs. Design leather wrap for your project needs from your design brief or drawings. Supply and install leather wrapping onsite or in-house. Supply leather wrapping to your upholsterer or chosen 3rd party. All Dawson Street Leather Co leather wraps are created to look and feel beautiful, they are also made for the rigours of real world use. For over a decade Dawson Street Leather Co have been supplying leather wrap for sports applications on bicycles, golf clubs, gymnasium equipment and other sporting articles where the human hand has exerted sweatband and mechanical stresses exceeding any architectural application.